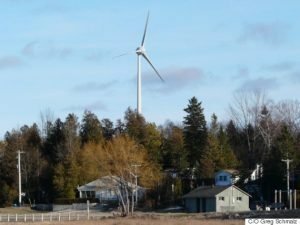 Last week, news of a $1 billion “charge” on properties leased for the K2 wind power project was sent out throughout Ontario, by an individual who happened upon them at a registry office. While incomplete, the documents do indicate a situation that should be of concern to anyone leasing land for wind turbines, or other wind “farm”-associated uses. …the lenders want to ensure protection of their loan. The security they look for is 1. the actual wind turbines (the capital cost to build them and their value), 2. the OPA contract (probably via an acknowledged assignment), and 3. the leases (due to concern the lessor may back out or sue the developer) that property owners have signed. The lenders would be looking at the consequences of, say, the property owner selling his property or someone else like a bank (who is providing a mortgage or a short-term loan to finance crops or cattle before taking the cattle to market or selling the crops), or the township (for non-payment of property taxes) stepping in and exercising their rights under their security or position (e.g., municipal taxes owing but unpaid). By registering against the property, the lender knows they would get first rights to pay up (property taxes) or stop the sale (if the lessee decided to sell) in order to cure the default etc. What that effectively does is tie the hands of the lessor until the contract expires or the lender is repaid in full. Any one who signed the lease is putting themselves in that position and it is surprising that more people don’t understand what they are doing when they agree to lease their property to a developer. We will be looking into the K2 documents in greater detail as is possible, but once again, the lesson for landowners is, it’s not simply a deal where you lease a bit of your property and get some money every year. These wind turbine leases are very serious documents, full of implications for the landowner. K2 is just another example of that object lesson. And people would not believe what that mayor said two years ago. So now he has been vindicated. Unfortunate, but some always have to learn the hard way. Huron County is Ontario’s # 1 prime agricultural county. How on earth was this allowed to happen? Take a look at how this county was/is promoting itself on the website. These turbines threaten every aspect of the future of Huron County. If it is to good to be true it is. These corporations are out to make a lot of money and will do anything to get it. The people who signed leases did not understand what was going on and did not investigate well enough. Their lack of action hurts us all. Parker,is this what is called ‘hypothecation’?